Posted on Mon, Dec 19, 2011 : 5:59 a.m.
Virginia Tech coach Frank Beamer is impressed with Michigan quarterback Denard Robinson, but he's familiar with dual-threat players. The Michigan football team has never played Virginia Tech, but Denard Robinson knows a thing or two about the Hokies' long lineage of mobile quarterbacks. The Wolverines' electrifying quarterback grew up idolizing Michael Vick, who led the Hokies to the 1999 national championship game and helped cement the program's place among college football's elite. "It looked like he was playing against little kids," Robinson said recently, laughing. "He was a man amongst little kids, it seemed. I rooted for him." 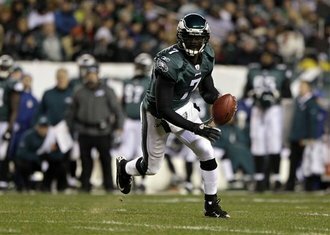 Michael Vick, now with the Philadelphia Eagles, passed for 21 touchdowns and ran for 17 in two seasons at Virginia Tech. Robinson has said he emulated Vick (and Peyton Manning) more than any other quarterback, and now he has drawn comparisons to the Philadelphia Eagles star for his own eye-popping runs and big-play potential. The flip side of playing like Vick, though, is Virginia Tech coach Frank Beamer and defensive coordinator Bud Foster are familiar with that style. In fact, Beamer said the Hokies could have an edge in game planning for next month's Sugar Bowl (8:30 p.m. Jan. 3, ESPN) because of the long list of mobile quarterbacks his program has featured. That includes Vick, Bryan Randall, last year's starter Tyrod Taylor and current starter Logan Thomas, who gives the Hokies' defense plenty of reps against a quarterback who moves well. "The highlights I've seen, (Robinson) can go," Beamer said shortly after the matchup was announced earlier this month. "Us having that type of guy gives us some experience, but it all goes back to the players being able to tackle the guy when you get him there." Although Robinson has drawn comparisons to Vick, Foster likens Robinson more to Taylor. The former Hokie and current Baltimore Ravens quarterback began his career as a run-first player before evolving into a more balanced signal-caller. Robinson underwent a similar transition this year under offensive coordinator Al Borges. Foster said Robinson might be even better than Taylor, who was the ACC Player of the Year last season and a sixth-round NFL draft choice. "(He's) faster, more explosive with his feet than Tyrod was," Foster said at a news conference Saturday. "He’s basically another tailback in the backfield, and we have to do a good job of negating his abilities to create big plays and explosive plays." Robinson has rushed 208 times this season for 1,163 yards, which trails only Northern Illinois' Chandler Harnish nationally among quarterbacks. He is 133-for-237 passing (56.1 percent) for 2,056 yards and accounted for 34 total touchdowns. He led the Big Ten in total offense. "Let me say this about Denard: He’s probably the most athletic, dynamic athlete at that position in the country," Foster said. Foster said Robinson also is similar to the quarterbacks Virginia Tech faced when former Michigan coach Rich Rodriguez was at West Virginia. The Hokies' defensive coordinator has faced seven Rodriguez-led offenses (including two when Rodriguez was the offensive coordinator at Clemson), and had success. He went 5-2 against Rodriguez and allowed just 15.7 points per game. That includes an impressive 34-17 win in 2005, when Foster's defense thumped a West Virginia offense that featured quarterback Pat White and tailback Steve Slaton. The Mountaineers were 11-1 that year, their lone loss coming to the Hokies. Now, Foster will try to replicate those results against Michigan with another stingy defense that allows 17.2 points per game, seventh best in the country. Rodriguez is gone, but his protege, Robinson, and remnants of his spread-option offense remain. Tue, Dec 20, 2011 : 7:19 a.m. So Denard likes Peyton Manning? That's the first truly disappointing thing I've read about this impressively talented young QB. Peyton Manning: someone might mention to Denard that it was Manning and his supporters who started the Hate Charles Woodson movement: because Manning thought that he, not Woodson &quot;deserved&quot; that year's Heisman. Manning then somehow managed to get sidelined in the Tennessee vs Nebraska game. That in turn gave just the edge Nebraska lacked when it came to being considered for the 1997 national championship. Despite not playing in a bowl normally considered &quot;championship worthy&quot; in the post season, the coaches poll voted Nebraska &quot;a share&quot; of the 1997 championship which MICHIGAN WON OUTRIGHT. Manning has since shown a pattern of alternating between Drama Queen and Injury Prone in the NFL. Manning: has also lost almost all games against Tom Brady and the Patriots: when Manning was supposed to be &quot;the Greatest QB in America.&quot; So - the Hokies think they know how to stop Michigan's No.16: I think we'd better hear what Al Borges and Brady Hoke have to say about that before getting too scared. I think Michigan's loss to Iowa was a fluke, I also think Michigan lost to MSU because there were some real fixing needed in the offensive line - which things WERE later fixed. I DON'T THINK VT's defense is as good as Michigan State's. Tue, Dec 20, 2011 : 3:01 a.m.
We must be very careful with that team, quite possibly they are a better team than we are. I believe we can beat Virginia Tech but only if we take them deadly serious. Mon, Dec 19, 2011 : 11:38 p.m.
Tue, Dec 20, 2011 : 1:14 p.m. I'd agree with you, Larry, if only the &quot;moderators&quot; would moderate and not solely censor comments, giving only vague ideas of as to why comments were removed. There is a difference between trash talking and playful exchanges amongst sportsfans. The majority of the &quot;trash talk&quot; on annarbor.com is playful in nature. I rarely see the usage of offensive language, and often times those involved bring the insightful analyses, statistics and remarks you enjoy. ERM's Ghost, for example, will go toe-to-toe with a pro-Rodriguez fan, but will back up his views with relevant, and interesting, information. In fact, looking over the comments on this story, I don't see many comments that add much depth or insight or perspective to the story, save maybe Hailmary's and TruBlu's no offense to other commenters. It's through the usually harmless bickering where a lot of the interesting nuggets are found. (Sometimes you have to dig through some clay to get to diamonds.) Whether annarbor.com tolerates it, there is a community of Michigan fans that visit their site daily and use the Michigan article's comment section as a place for discourse. Maybe they didn't intend for it to be used as a &quot;hangout&quot; for fans, but that's how it's been used for years. Censor, er...moderate all you want when it truly gets out of control, but is there really any need to remove benign, humorous and short exchanges between the Theo's and Meangoblues on the board? Tue, Dec 20, 2011 : 4:09 a.m.
Amen. Post after post of insults and name-calling doesn't make for very good reading. That said, I wish the enforcement of the &quot;conversation guidelines&quot; was a bit more consistent. Some posts are allowed to stay, others (including my own) are taken down based on who-knows-what criteria. Probably little more than the &quot;report abuse&quot; link. Mon, Dec 19, 2011 : 7:02 p.m.
Denard is a humble young man. With exceptional skills. I would think he has the same skills in the class room. Mon, Dec 19, 2011 : 5:25 p.m. Thanks for the endorsement RudeJude...... MEEEEEEEEEEEEEEEEEEEEEEANchigan football will roll in the big easy, As the man crush crowd continues to make us queasey!! Mon, Dec 19, 2011 : 5:26 p.m.
Mon, Dec 19, 2011 : 4:52 p.m.
Hey, what's up with the deletions? I know this will get &quot;erased&quot; but what happened to giving posters a chance to respond with feeling and attitude? The first post today was negative and I disagreed. Gone! Three of the first 6 posts were erased. Does someone need extra creamer in their morning coffee? If you're not careful pretty soon all of your posts will be from WCiMFH followers. Happy Holidays. TiM Go Blue! Mon, Dec 19, 2011 : 5:13 p.m.
Mon, Dec 19, 2011 : 3:46 p.m. This is probably the MOST RELEVANT story written about the Sugar Bowl matchup. Mon, Dec 19, 2011 : 3:22 p.m. I don't know about the story value, but look at that right arm! Go Blue!! Mon, Dec 19, 2011 : 3:07 p.m. They could do a story about Denard's bicep. That little guy must have about 2% body fat. Mon, Dec 19, 2011 : 3 p.m. I liked this story. 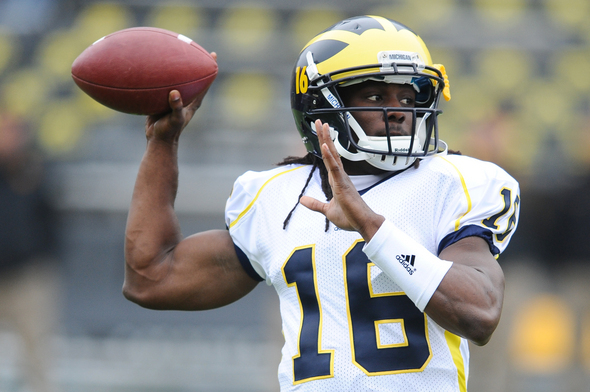 Virginia tech's experience in facing Denard like QB's is interesting. It must be hard to come up with stories between the end of the season and the bowl game. Mon, Dec 19, 2011 : 2:36 p.m.
Mon, Dec 19, 2011 : 1:59 p.m.
Kyle, if you're looking for a story in the down time, how about one regarding the delay in the release of the Ohio NCAA sanctions? They were supposed to be released last week at the latest, according to OSU's AD, Gene Smith. Instead, the NCAA has gone out of its way to aid Ohio in allowing the program two coaching staffs, one for recruiting, one for bowl preparation, much to Dave Brandon's chagrin. Ohio has been racking in major recruits in the last week, some taken away from Big Ten opponents, while landing other major unexpected recruits, including a five-star DE, Noah Spence. Assuming the release of sanctions may hamper their recruiting abilities, it is hard not to speculate the favoritism for Ohio by the NCAA in their recruiting aid and delay of sanctions. Any information on when these sanctions will be released? Tue, Dec 20, 2011 : 12:52 a.m.
Mon, Dec 19, 2011 : 3:04 p.m. They'll never cover that because they would have to write the obvious. It's all about money. The NCAA is going to do everything possible to keep Ohio strong for all the revenue it produces. Mon, Dec 19, 2011 : 2:27 p.m.
Rabid, I think it'll come before that, but then again, it wouldn't surprise me if the NCAA announced a delay in the release of sanctions for whatever reason to release them in the spring. Mon, Dec 19, 2011 : 2:20 p.m.
Mon, Dec 19, 2011 : 2:16 p.m. The holidays are approaching. If Ohio has the NCAA in its pocket as it appears, expect the sanctions to be released Christmas Eve or between then and New Year's, when the majority of us are with family and aren't paying attention. Mon, Dec 19, 2011 : 1:40 p.m.
Mon, Dec 19, 2011 : 3:16 p.m.
Ditto. People have nightmares about RR. I have nightmares about converted tight end Navarre and that sidearm throw. If they gave points for style, athleticism, ingenuity, speed and beauty- the John Navarre offense under Carr would get 0-0-0-0-0. Mon, Dec 19, 2011 : 12:03 p.m.
you must have been hard up for a story. Mon, Dec 19, 2011 : 6:27 p.m.
You read and commented on it. Duh!